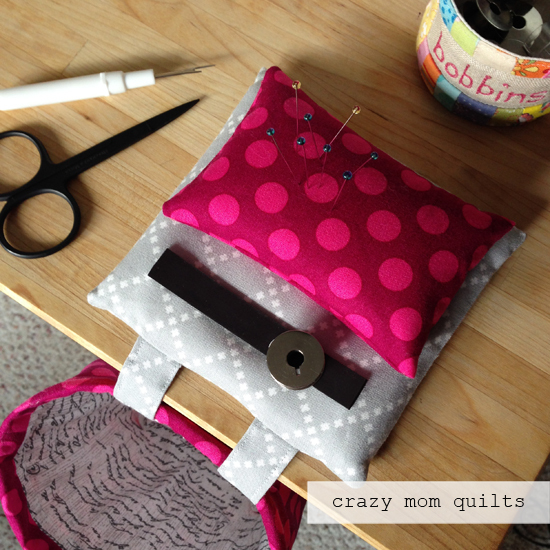 crazy mom quilts: a thread catcher, fabric ribbon and mighty lucky, oh my! What do you fill your pin cushions with? Have you seen the thread catchers that use a tile to hold it down? Which would you prefer? why or why not? Love the colors of your thread catcher! Love the thread catcher! I got a similar one in a guild swap last year and I love it. I'm going to have to look into this "club"... sounds like fun! I have been having fun making pincushion from your Good Neighbors fabric for my quilty friends. Thanks for sharing yours! I love the idea of the magnet and the peppermint ribbon is pretty great too! Wow, the fabric ribbon is so perfect! And the touch of the magnet on the pin cushion / thread catcher is a perfect detail that will make that such a handy tool for your friend. Great use of fabric in ribbon form. Love the thread catcher/pin cushion. Your friend will love it! The quilting club sounds fun. what a lovely gift ! I hadn't thought of putting a magnetic strip there for bobbins. I'll have to check with the Bernina sewing machine guy to see if it would be safe for my QE750 bobbins. They have some kind of magic strip in them that tells me when they are empty and the magnet might do something bad. That hand made ribbon is really clever. You are giving me ideas for using up some less loved fabric to make my own ribbon for gifts. Thanks for the inspiration! Sweet thread catcher, that magnet is so handy! The ribbon is utterly adorable too! Just want to say a big thank you for the year. Love the linky party, and the ability to find so many inspiring blogs. Happy holidays, and a properous New Year to you. Love the home made ribbon! And you are so right, it would be perfect for the backing of a Christmas quilt, or pillow. It's always a pleasure to hear that a friend likes a made gift, and I can see why she loves the catcher you made her. That fabric totally looks like peppermints! And the thread catcher pincushion needs to be added to my to-sew list. I could especially use that magnet as I seem to be awesome at losing pins all over the place (namely, the floor) which drives my husband batty. 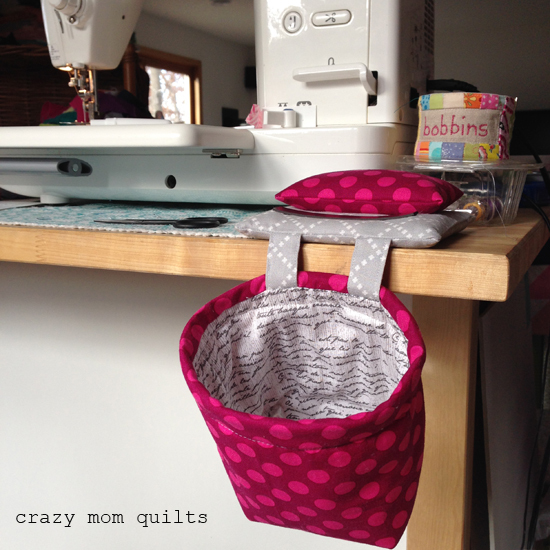 Love the cute patchwork "bobbins" catchall! I have your tread catcher pattern & that just gave me a great stocking stuffer idea for my mother-in-law. Cheers! I love your ribbon you made. I am quilting, by hand, your Trees quilt for my grandson who got married a little over a year ago. I added a row of the tree blocks on the side and across the bottom to make it large enough for a queen sided bed. I will be showing a friend of mine your method for binding a quilt. She has made table runners for some friends but does not know how to put them together with backing, batting, and the figured quilt. And then binding them. fabric ribbon - who knew? looks amazing, and that would be a great print for a quilt backing! Hmmm... that Mighty Lucky Quilting Club sounds like a great Christmas gift! I might need to send a few e-mails! :) Thanks for sharing it! i thought your fabric was peppermints. i don't think i would have looked closer to find that they weren't had you not mentioned it. Good use for your cute & versatile fabric line! Love the fabrics used for the pin cushion thread catcher and the ribbon is a great idea. Thanks for the idea. I have that kind of pincushion made by Poppyprint herself--I love the addition of the magnetic strip--that's pretty genius. 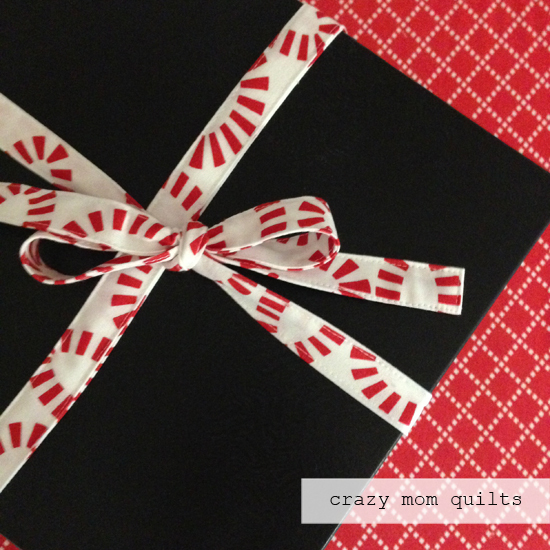 Your red and white print would indeed be an awesome backing for a Christmas quilt! And I signed up for Mighty Lucky--looking forward to it! Thread catcher? Isn't that what a vacuum cleaner is for? But a pincushion complete with magnetic strip for couch sewing? THAT's INCREDIBLE. Love the fancy ribbon! I usually just leave raw edges on mine. Your ribbon is lovely, and very "you"! The Mighty Lucky club sounds wonderful. I am not sure I have the basics down all that well, but I might just sign up anyway. I am exactly the do-it-someday sort of person in the description, and the roster is pretty hard to resist. Great thread catcher. Love the fabric you chose. Great idea to make your own ribbon! That definitely looks like peppermints! It's perfect. I like the addition of the magnetic strip, very clever! Love the 'ribbon!' It adds a special touch! Congrats on Mighty Lucky! What an awesome group of Modern Quilters to be joining! Love the thread catcher too! I love your fabric ribbon, great idea! The club sounds fun. Your fabric ribbon looks awesome. Trying to convince the hubby to get me the club for my birthday. Think it was vetoed. I love that cushion with the magnetic strip - that is so neat - but where do you buy a magnetic strip? this would really come in handy. I love the homemade ribbon, it definitely looks like peppermint! And I'm interested in the quilting club, it sounds like it could be a really cool thing to get involved with. I love the idea of homemade "ribbon"! I've got a LOT of extra fabric around. I think there might be some of these on my packages this year! What cute fabric you used. <3 the Raspberry colored Polka Dots. Thinking of making some adorable ribbon for wrapping presents now. Thanks for the idea. I like your pincushion/threadcatcher! Also, it is a great idea to decorate christmas gift with fabric. I will try it for sure this year!! Love the fabrics in the pin cushion! Ha! The magnetic strip is a great idea - really the perfect thing for random pins, and a super place to NOT lose a hand sewing needle while sitting in the couch. I will incorporate that little nugget of an idea while making a pincushion for me! Well, that fabric ribbon is the cat's meow! Gotta make some of that! The fabric does look like peppermint. Fun! Love the peppermint candy ribbon..it would make a great Christmas backing!! The peppermint ribbon is awesome, I am really looking forward to seeing your whole fabric line in person! I love the thread catcher! I need to find the time to make something like that for myself. And the ribbon is genius! I don't have a finish this week but thanks for hosting the link-up every week. No finishes this week! I really like your fabric,so I have bought a layer cake. I am having trouble deciding what to use it for! So many choices. I love your thread catcher. I have one that my mother gave me years ago and really like it. J'adore !! C'est hyper pàratique et les couleurs toniques. What a darling thread catcher, I'd call it the deluxe version. And you're so right about the fabric you used for ribbon being like peppermint candy 😊 I've Ben considering joining the Mighty Lucky club, I'm glad you reminded me, it sound really interesting. I love your fabric ribbon! Love your thread catcher - actually love everything you do. My carpet and vacuum cleaner would love that thread catcher. I'm a thread flinger. ;) Just drop it, get it out of the way. This would work well for me. Love the magnetic strip! What a great idea that I will be using! So many useful ways it will be helpful! Also love your fabric ribbon! Another idea to put in the arsenal! Thank you for all these helpful ideas! I have yet to make a thread catcher....and I adore your version. I will use that ribbon idea=-- it's a great one! Hi Neighbor! Actually, I'm from Arizona! Finally time to bundle up in Quilts, kind of! Anyways, I'm definitely going to do the ribbon idea with my quilting sisters, very cute inspiration! Love reading your blog, wish I could participate more with the link - ups, maybe someday. Thanks for the give-away! Brilliant ideas here Amanda!!! The magnet is such a useful addition to the thread catcher, and using your fabric to make ribbon is just genius!!! I am excited about the Mighty Lucky subscription. Congrats for being part of this! Hmmm....would one of these thread catchers keep my floor cleaner?? I would have to train myself to use it rather than tossing threads on the floor! Any suggestions for alternate pincushion stuffing? There are nut allergies in the family. That "peppermint ribbon" looks delicious, I'd probably eat my gift haha. The thread catcher bag/pinnie is the ultimate sewist /quilter gift. Silly me didn't realize what that little strip was for..thanks for sharing. Just checked out Mighty Lucky and it sounds wonderful! What a lineup! What a terrific gift idea! Also, I do love the peppermint looking fabric for backing on a Christmas quilt. Must order some now! I have a thread catcher and pin cushion next to my machine made from denim....love it. Going to make one with a magnetic strip like yours for my sewing chair upstairs. love your ribbon, very cute. the club sounds interesting. Love how the red and white ovals look when you can't see the whole oval. Hmmm some interesting piecing possibilities! 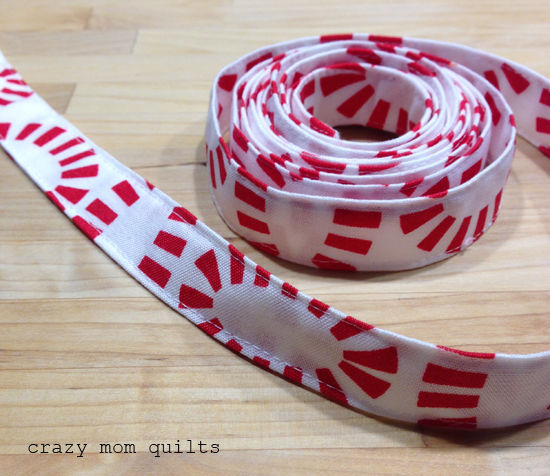 I really like the thread catcher idea - and the ribbon, which reminds me of peppermint candy. 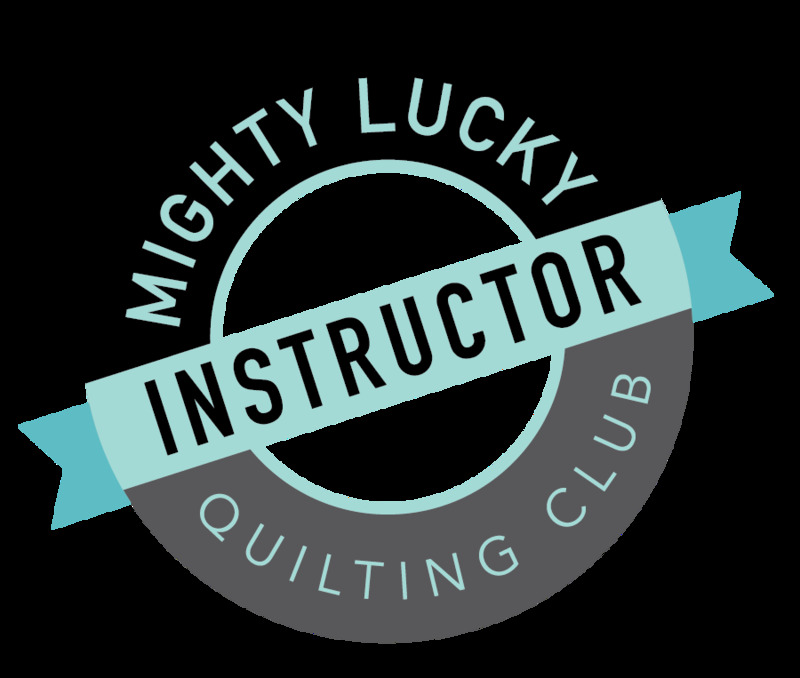 :) Congratulations on being chosen for the Mighty Lucky Quilting Club - that is awesome! Love your thread catcher/pincushion. I think I need to make one of these for myself. Your friend's thread catcher is totally adorable! I have also made fabric ribbon before, when you have a need and our stash is available, it's a win win situation. ust what all sewers need, I do have a little thread catcher but yours is far superior. your friend can really be lucky to have you as a friend and to receive just a fantastic gift! So cute! I love the fabric ribbon. I wonder if I could muster the corsage to do that too! Love that dark pink with the text print! I have that book, and want to make one of those for myself. The 'peppermint' fabric would be perfect for a Christmas quilt!